A working mum and trainer who was a trailblazing female jockey, her daughters and a rejuvenated 'crock' galloper will be the sentimental favourites, with a proviso, into a $75,000 TAB Highway Handicap (1800m) at Royal Randwick on Saturday. 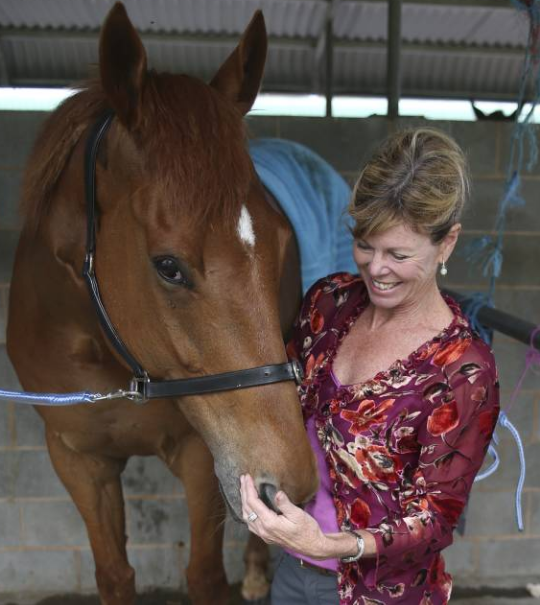 Albury trainer Jodie Bohr who has accepted with a seven-year-old veteran ‘swimmer’ Footmark ($7.50 on TAB fixed odds), revived some marvellous memories during a break from her reception desk at an Albury breast screening clinic. “Back in the early 80s when I rode for my dad Trevor, I was the first female apprentice to win at Randwick and the first female jockey to win at Warwick Farm,” Jodie recalled. “Exciting times back then, I rode about 300 winners on regional tracks and those in town. “These days it’s trackwork in the morning where my daughters Hollee (19) and Shanae (21) ride most work, and then I head off for my regular job. Hollee is apprenticed to her mum - both girls are capable and dedicated riders and we’ve got seven in work. “But can I say, Footmark has drawn barrier 16, so we can’t confirm we’re coming up until we talk it over with the owners. Footmark, ultra-consistent with three career wins and as many placings, has been allocated equal topweight of 57.5kg in a Class 3 for Andrew Adkins. The reason Footmark has had only 11 starts at seven years because of serious suspensory problems in two legs. It was career threatening. “It took a long time to get him right and to the track but he’s done a super job.” Footmark certainly has. Amazingly, the veteran won by widening six-plus lengths on a heavy 10 track at Albury on August 21, and then was dominant again at home on October 13. “His last win was on a good track, so he’s not just a heavy tracker, he’s adaptable on all surfaces,” Jodie added. Jodie had nominated Footmark for a Highway recently but elected to stay at home to win a weaker race. While he is up considerably in grade from class 1 and 2 wins on his home track, winning form on any surface can’t be faulted. And the way he has closed off at 1500m and 1600m suggests the 1800m won’t be a problem either. Another highly interesting acceptor is the Dryden and Collings emergency, Red Heat ($11). She’s a half-sister to ACT racing great Single Gaze, a Group winner and Caulfield Cup placegetter. Red Heat’s dam is Redaluca’s Gaze. Mother to Race Her is the current $3.40 favourite. At present headquarters is rated a 'soft 7' in fine weather with another booming response expected to witness the incomparable Winx at Moonee Valley who looks a formality for a record four Cox Plates.